PC cases come in different designs and variations. Some come complete with a power supply while others do not feature any power unit. And choosing either totally depends upon your PC build requirement. We at Tech News Today recommend computer cases with inbuilt power units for obvious reasons. Firstly, they are cheaper in the long term and offer a superior performance to meet most of your computing needs. We start our reviews with the one that will certainly grab your attention. This is none other than the ROSEWILL Micro ATX Mini Tower PC case. Besides the sturdy construction and elegant aluminum look, Rosewill offers excellent airflow for optimum PC performance. It comes with a 90mm rear case fan that can handle heavy usage for longer periods, by dissipating heat accordingly. Does not have RGB lighting. 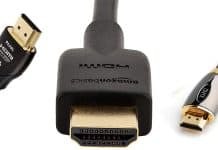 Features only 2 SATA connectors. The ROSEWILL R521-M is worth checking out, as it supports nearly all types of motherboards . This comes with tons of premium features that guarantee an above-average performance to suit most of your computing needs. Moreover, the fact that you do not have to buy a separate power supply unit, goes a long way to cut down on your computing expenses. With all these amazing features, we highly recommend the R521-M. Sounds good, right? Antec might not be a household name, but the Minuet350 is a unique one that will surely dazzle every PC enthusiast. It comes in black steel, ultra slim design, ideal for MicroATX motherboards. 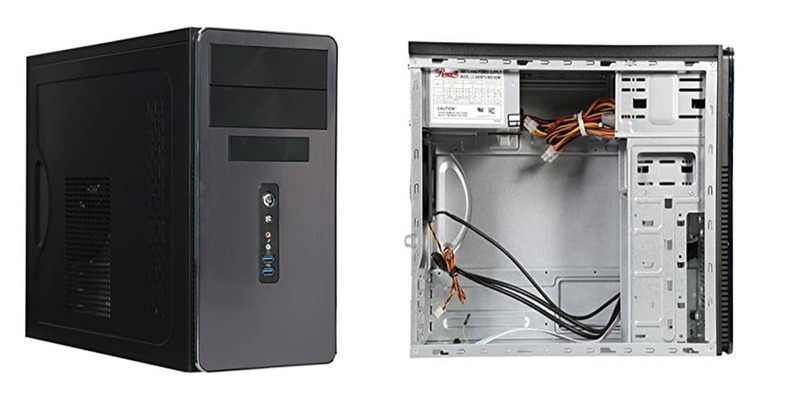 The design ensures that your PC does not occupy too much space on your office desk, while still allowing you to enjoy all the features that come with standard computer housings. The Antec Minuet350 comes with a 350Watt 80PLUS certified PSU. It also has a reasonable cooling system that consists of 80mm fans with 3-speed switch control. 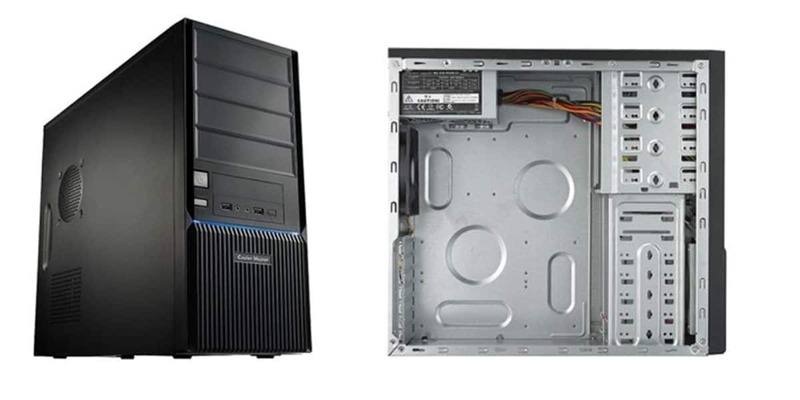 Interestingly, Antec Minuet350 and power supply combo support up to four expansion slots despite its diminutive size. Additionally, the front panel offers microphone and headset jacks, a SATA slot and 2 USB 2.0 ports. Does not have high speed USB ports. Pricey compared to its competitors. The Antec Minuet350 is simple in design yet superior in performance. It comes with all the vital features that ardent computer users would want in a PC case. Furthermore, it is lightweight and does not take much space, making it the perfect choice for busy work stations. The Elite 350 from Cooler Master is a professional looking, elegant mid tower designed to support all the vital accessories and components without congesting the interior. It features a durable, steel body that can withstand accidental knocks. In terms of aesthetics, the Elite 350 does not come with RGB lighting. However, this also features an ABS plastic front bezel that gives the case a unique, stunning appearance. The performance of Antec Minuet350 has never been in question. We discovered that it has an efficient cooling system that supports up to three multiple fans running at the same time. Furthermore, it has more than 7 PCI expansion slots and it supports a wide range of motherboards, including standard ATX and Micro ATX boards. Supports a variety of motherboards. Mounting holes might not be enough for some types of motherboards. The Elite 350 is just but one of the many high-quality computer cases manufactured by the Cooler Master brand. Thanks to its powerful power supply and multiple expansion slots. 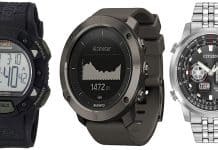 Furthermore, it comes with an excellent cooling system that guarantees optimum performance for longer periods. It is therefore not surprising that we recommend this ATX with a power supply to anyone looking for a formidable PC unit. The APEX MI-00 is one of the most fascinating PC cases available on the market today. It comes in a stylish, mini design that is space saving and extremely portable. It measures 220 x 300 x 129 mm, making it one of the smallest in the industry. Despite its miniature size, it comes with all the essential features you would need for gaming and general computing. It has a power supply unit that delivers up to 250 Watts, which is sufficient for most computing tasks. As far as performance and functionality are concerned, APEX MI Series MI-008 with power supply features 2x USB 2.0 and 2x audio ports for all your peripheral connections. It also comes with two 3.5” external and internal drive bays for sufficient expandability. Moreover, you can place them to stand either horizontally or vertically depending on your needs, giving you the much-needed space to perform other tasks on your work table. In our opinion, this is tailored for PC systems that perform special tasks like controlling info signs in an airport or in a big hotel, as it has a small size, suitable for use as a video wall controller. 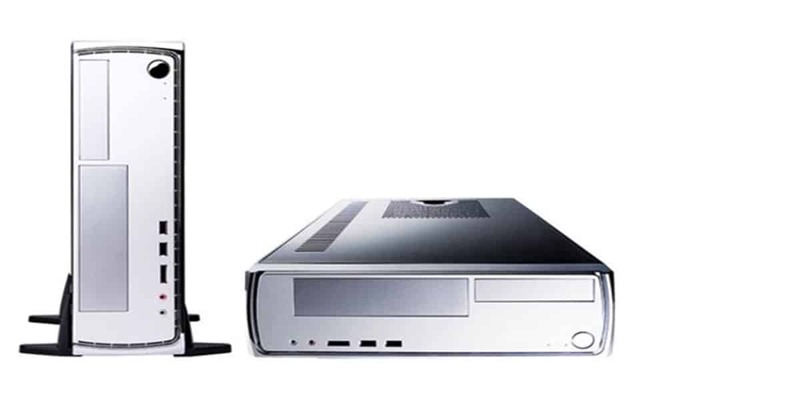 It could also be ideal for Home Theatre PC systems thanks to it’s expandable 3.5” internal and external drive bays. Like any other computer accessory, buying the best computer cases with power supply is not easy. With so many options available in the market today, even the most experienced enthusiast will have a challenge settling for the ideal option. Nevertheless, we are here to help. 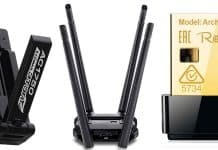 Whether you are looking for a gaming one with a power supply or a simple one that consists of a power unit, here are some of the features that you should consider. The beauty about computer cases is that they come in a variety of sizes and designs. 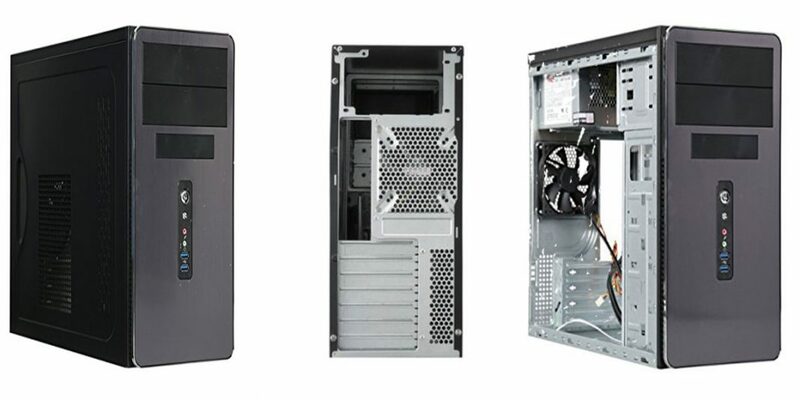 The most common one include Mini-ITX , Micro-ATX (SFF), Mid Tower and Full Tower. The size that you pick will determine the components that can be accommodated, without cramping up the system. The form factor will also determine the type of motherboard supported. Cooling is crucial for any PC case with power supply. Fortunately, the latest PC housing units come with highly efficient, modern fan and thermal systems that quickly disperse heat from the interior. 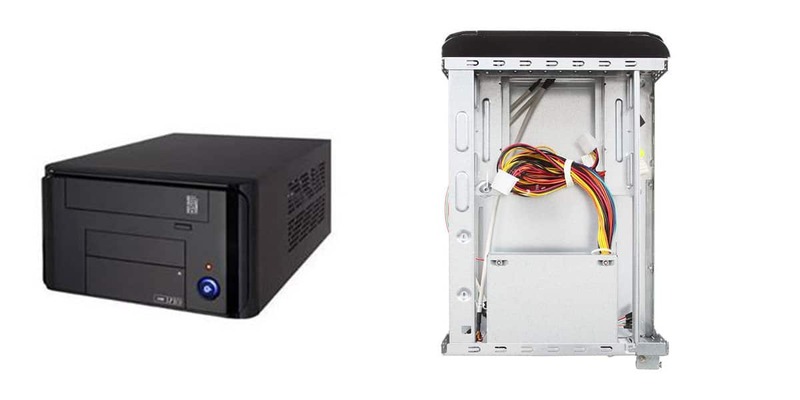 A good PC housing unit should allow you to expand and insert additional components. With this in mind, it should have expansion slots and drive bays to accommodate additional peripherals. However, if you want a unit that is ideal for use in limited spaces, then you should go for a small form factor or a mid-tower case. Cable management ensures that there is excellent airflow with minimal risk of damage to internal hardware. It also prevents various risks such as short-circuiting, while creating space for additional components. What issues should I expect from a small form factor computer case? Most small form factor them normally have issues with airflow and thermal performance. This limits the number of hours an SFF computer can be in operations. Thankfully, all our recommended ones have excellent cooling systems with highly efficient PSU units. Is a 500W PSU better than a 250W PSU? In terms of performance, the 500W PSU is better than the 250W, but they tend to be noisy compared to the latter. Furthermore, 500W PSUs are recommended for computers that perform heavy tasks such as gaming. 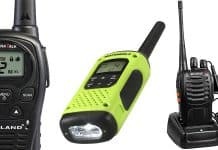 Different cases come with different features. No matter your choice, always go for a unit that meets most of your computing needs at a budget-friendly rate. Importantly, remember to leave a comment or even ask a question. We would be more than happy to assist you!